The AIM NetworkNews and PoliticsFool me once…. Yes they were all lies and he got away with it too. Perhaps Australians will not be taken as fools the second time around. We were lied to by GW Bush, John Howard and Tony Blair and that is why the world is up to it’s neck in refugees. Seeing as it was Bush’s lies to begin with why not just send the refugees to his doorstep and let him deal with them. I’m over it! It’s no wonder Australians are fed up with this issue. We can’t save the world. If the USA would just stay out of other countries’ businesses the world would be a more peaceful place. They destroy everything they touch! There are no restrictions on the number of times we can be fooled. Since primary school when, I witnessed the propaganda machine fool this country into voting for our crappy national anthem, I have witnessed that machine fool it time and time again and I don’t expect anything to change anytime soon. I have a sinking feeling that Abbotts scare campaign combined with outrageous Murdoch headlines will work once again. This would likely be the end of democracy in Australia. Just to make it clear to those who’ve never heard the saying. Young people don’t read Murdoch. At the last election there were between 1.2-1.4 million eligible people who did not register to vote. There were also over 800,000 informal votes (from memory). We REALLY need to help our young people understand the importance of their vote because it is them who are under attack – climate change, housing affordability, youth unemployment, deregulated uni fees, income inequity, access to welfare, two-tier education and health system…. We need some concerts by our concerned musicians, our artists and performers who are having their funding slashed – inspire our young people to fight. Are you on a mobile device, Kate? Kaye, who is going to teach our youth that democracy in Oz and their future lives depend 0n their INFORMED votes ? We need the ABC to do that, because the popular press won’t . They prefer an oligarchy they can control. That is my aim in typing my fingers to the bone. I am also a teacher and I know you have to engage your audience to get a message across. Music has done this in the past with young people. I remember watching the Live Aid concert and I always get a bit teary at Michael Jackson’s “We are the World” because when my daughter did some volunteer work at an orphanage in Cambodia, all the kids lined up and sang that song. You have probably seen this clip by Leo Sayer. Wake them up…get the message across however we can. Remember court papers I was writing on behalf of a toddler, who managed the third over dose on mum’s take away methadone The Psychiatrist report made simple statement that won the case, was hard to repute. First time unlucky. Second time careless. Third time criminal. If Abbott gets votes third time around, it would be a criminal act played on our democracy. This article caused me to remember something I heard about Howard many years ago. “It’s said that Winston Churchill was a Statesman. He called on the people of Britain to take on the awesome might of the Third Reich. Some people consider John Howard to also be a Statesman. Your writing is extremely focussed and I am grateful for your contributions. During the preparations for the 1999 Australian-led UN East Timor engagement, what Howard regarded as the sycophantic pro-Asian tilt of his predecessors was rapidly discarded. Under Howard’s leadership and inspiration, the republic was rejected in November 1999 at a national referendum. And, because of his government’s unwillingness to offer a formal apology to the Aborigines or to countenance the hitherto uncontroversial idea of Aboriginal self-determination, the decade-long quest for a symbolic act of reconciliation, at the moment of the centenary of Federation, was nonchalantly scuttled at the Sydney Opera House in May 2000. The re-imagining of Australia on the basis of multiculturalism, Asian integration, republicanism and reconciliation was associated, in Howard’s mind, politically with the Keating government; socially with those cosmopolitan left-leaning elites, who still treated ‘little Johnny Howard’ with considerable contempt; ideologically with the mindset now almost universally known as ‘political correctness’. In order to conquer Keating, the elites and political correctness, as is now evident in hindsight, only one decisive blow was needed. It was delivered in the government-manufactured Tampa crisis of late August 2001, where the Royal Australian Navy, assisted by crack SAS troops, mounted a successful two-month military campaign whose purpose was to prevent fishing boats with refugees from the Middle East and Central Asia reaching Australian territory. In striking this blow Howard transformed Australian politics. By exposing the moral gulf between its working-class and left-leaning middle-class supporters, Tampa completely destabilised the Labor Party. By exciting Hanson enthusiasts, with the military repulsion of refugees, Howard destroyed One Nation almost overnight, by satisfying the political appetite on which it had fed. And by treating the humanitarian considerations of old-style liberals with such complete disdain, he converted the party of Deakin-Menzies-Fraser into the party of economic rationalism and populist conservatism that it remains to this day. DAVID HICKS: Hi, I’m David Hicks. When you were Prime Minister, you left me in Guantanamo Bay for five and a half years. During that time I was detained without charge for a long time; I was denied a fair trial; I was tortured. Do you believe that I was treated humanely and that the military commission was a fair system? Thank you. 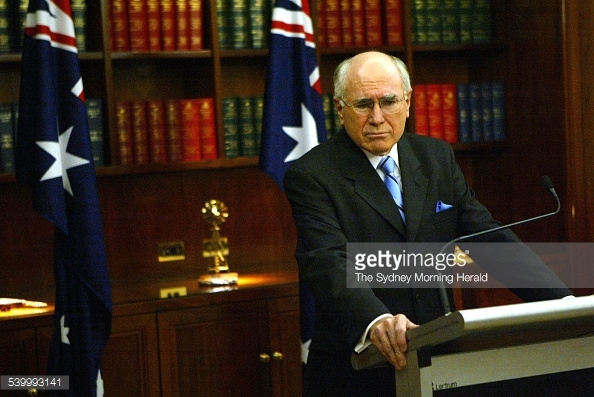 JOHN HOWARD: Well, I’d make a couple of responses to David Hicks. The first is that isn’t it a great country that allows this kind of exchange to occur and this is not the sort of exchange that would occur in other countries and in dictatorships and it ought to make all of us – whatever our views are about my government’s policies concerning Mr Hicks, it ought to make all of us very proud that we live in a country that allows that sort of exchange. Murdoch’s Daily Tele & its interstate counterparts are not designed to be “purchased”. It’s a loss making propaganda distributing venture designed to be passively taken in by the uninterested voter who walks past the headlines every time they step into a servo/suermarket/cofee shop/McDonalds & gets subliminally influenced. “The prime minister has been impervious to arguments about the intelligence and propaganda value former terrorists could provide. He just wants them all to stay away. These go-for-the-jugular combative instincts might come at the expense of effectiveness. If we really want to stop young Australians from being radicalised, then shouldn’t we be using potential assets such as ex-militant Zaky Mallah to warn off Muslim teenagers from signing up with the jihadists? Instead, for short-term political gain, Mr Abbott has gone all out to use Mallah to turn up the political temperature, scorch the national broadcaster and anyone else who gets in the way on this perilous political warpath. As a strategy it’s full on. And it’s risky. Some of the time you can fool some of the people, You can fool the austryan voter all of the time!